After drawing the attention of a pair of Stormtroopers, the Rebel force aboard the Tarkin splits up to carry out their mission. On the bridge, Vader receives the news of their attack, but says he'll take care of the problem personally, which the officers hoping to eliminate him view as their best chance at doing so. On the planet below, Lando climbs out of the Falcon's holding compartments, having stowed away in the hopes of proving his trustworthiness to the Rebels, just as the ship draws the attention of some Stormtroopers. Aboard the Tarkin, Chewbacca and the droids manage to destroy a target beam generator, while Leia fights off a squad of Stromtroopers, hoping Luke is having more luck. But Luke, nearing the main reactor, is also nearing a waiting Vader just as the Imperial officers strike, opening an airlock near Vader. Both Vader and Luke manage to survive, but Luke loses his proton bomb. However, Leia finds herself near the station's main weapon machinery, and shortly thereafter, radios everyone to meet her at the docking bay. Just as Lando manages to bribe away the Stormtroopers and take off, the Rebels on the Tarkin steal a shuttle and fly away. 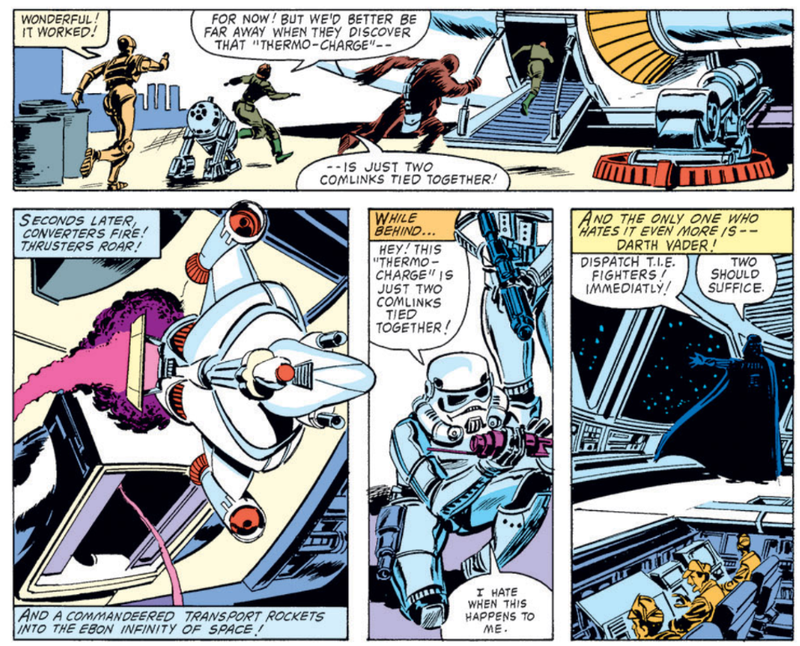 They fend off a pair of TIE fighters with Lando's help, then board the Falcon just as Vader joins the fray in his personal TIE. Luke and Lando manage to outfly Vader just as the Tarkin fires it weapon, hoping to destroy both the Rebels and Vader, but instead, the station explodes, as Leia explains that she was able to reverse the polarity of the ship's weapon so that it basically shot itself. An issue after its introduced, the Tarkin is destroyed, bringing a surprisingly swift end to the Empire's latest superweapon. 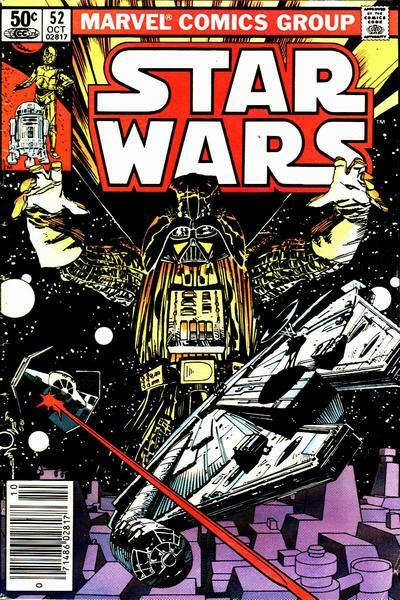 In a subtle bit of plotting ("subtle" in that nothing draws attention to it in this issue), events conspire to once again ensure Darth Vader is off the Empire's doomed space station, flying around in his personal TIE fighter, when its explodes, ensuring he lives to fight another day. There's a legitimately funny bit where Luke tosses a fake bomb at a pair of Stormtroopers, then says "let's get out of here before they realize it's just two comlinks tied together" and then the Stormtrooper says "that's just two comlinks tied together", echoing Luke's exact phrasing. 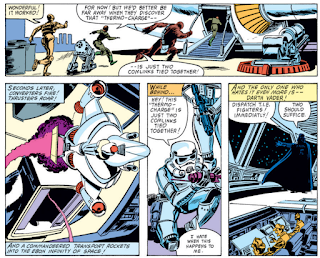 To a point made by Blam in the comments to issue #51, the Falcon is recognized by a pair of Stormtroopers on the planet where Luke & Leia left it parked. 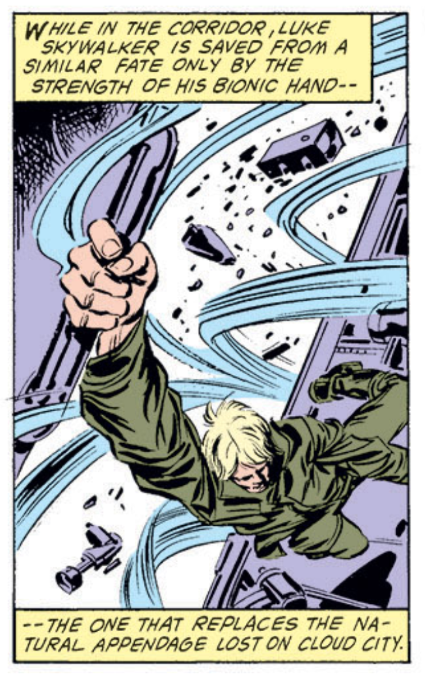 Luke's bionic hand prevents him from being swept out of an airlock. 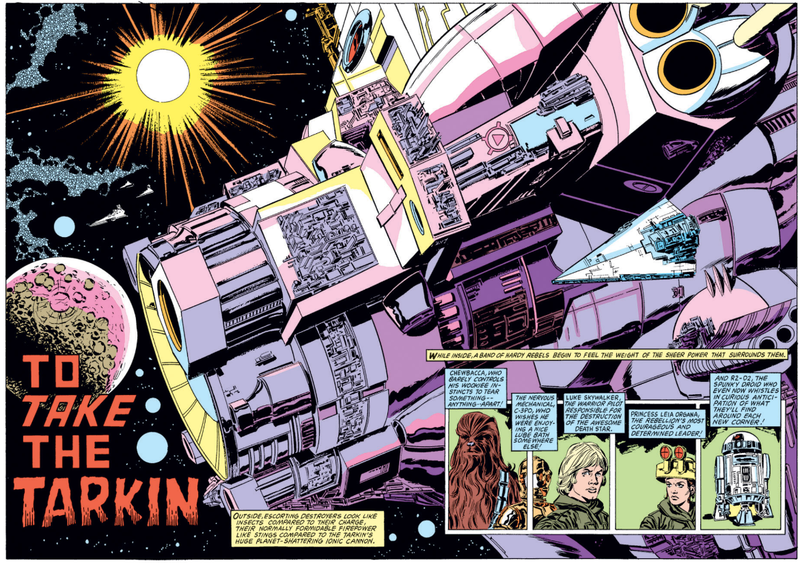 Great double-page spread from Simonson & Palmer showing the Tarkin in all its glory, and giving an effective indication of its size relative to a Star Destroyer. The main weapon on the Tarkin is described as being ionic; in Star Wars lore, ion weapons are like localized EMPs - they disable electronic equipment (especially shields) but do no physical damage, which is not at all what the Death Star's primary superlaser did. How long a story should be is a tricky question; too short, and the ideas in it come across half-baked, the characters underdeveloped, and the audience is left feeling unfulfilled. Too long, and the story becomes a slog, plot points become padding, and the audience is just left wanting it to end. All of which is just a preamble to the fact, that for all the promise inherent in the several idea put forth in this story, in the end, it is at least an issue too short. Both "the Empire has built another superweapon" and "an Imperial cabal wants to oust Vader" deserve more than two issues of attention, and trying to cram the resolution to both into one issue makes this feel overstuffed, its ending entirely too pat, and its two really great plotlines squandered. 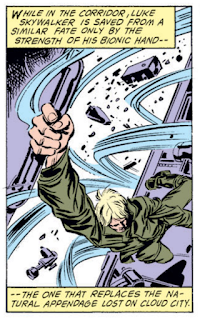 I mean, "The Wheel Saga" had six issues, that thing with Luke on Waterworld had five. Those were both fine stories but definitely on the "too long" end of the spectrum, whereas "To Take the Tarkin", with infinitely more interesting ideas in the mix, is over before it ever really begins. The plot against Vader culminates in one attempt to blow him out an airlock - which hardly requires any kind of conspiracy - and while the resulting display of strength on Vader's part is pretty awesome (as is the way the timing of the attack interrupts a potential Luke/Vader encounter), that plotline deserved more. And Leia's move to destroy the Tarkin is clever (and her willingness to destroy herself and her friends in the process is a nice touch of characterization), but suffers from the tossed off way it's presented, on the final page of the issue (I mean, why didn't they just do that on the Death Star? All it takes to destroy the station is moving around a couple of wires?). In a story with more time to let these ideas be setup and play out, those criticisms might be easier to handwave away (or been handled better). 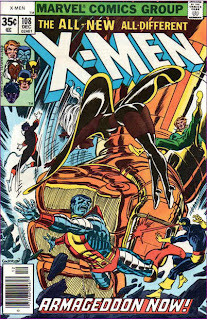 As is, it's hard not to feel like this story was meant to go longer, but then Michelinie realized he only had an issue to wrap everything up instead of two and scrambled to do so. The core ideas here are strong enough (and the Simonson/Palmer art enjoyable enough) that "To Take the Tarkin" still stands as one of the series' highlights thus far; it's just a shame it's not a little bit longer, and a little bit better. A fill-in with a rather odd origin. Good points all around. Perhaps since we're already retreading the Death Star, why not redo an imminent strike by the Tarkin on some rebel planets, etc., to pad out a potential third issue. The Anti-Vader Conspiracy was all too brief, an Operation Valkyrie arc would've been interesting. I don’t recall if it was named last issue, but the planet below the Tarkin is called Hockaleg and I can only hope its demonym is “Hockaloogie”. That’s what sh— um, I mean… Yeah, I agree. With both that and the assessment that it’s otherwise a pretty good story, making the squandered long(er)-term potential of both the weapon and the anti-Vader cabal all the more frustrating. I feel a bit less charitable than you towards the fact that literally everyone dies but the Rebels and Vader, though, even if the specific reason he escapes with his life works. Presumed reference: Luke gets into a blaster fight in Section TH-11 — which is no doubt across from Section X-38.